The Raspberry Pi Foundation has announced the resurrection of the Model A+ form factor, four years after it had been seemingly abandoned in favour of full-size Model B+ and ultra-compact Zero variants, in the form of the Raspberry Pi 3 Model A+. The original Raspberry Pi Model A, launched shortly after general availability of the Model B, was designed to offer Pi functionality at a reduced price. Using the same circuit board, the Model A dropped from two to one USB ports, ditched the Ethernet connectivity and associated dual-function USB and LAN chip, and halved the amount of RAM available. When it came time to refresh the range, the Model A+ introduced a more tempting form factor: still only one USB port, still no Ethernet, and initially still half the RAM before a mid-stream refresh doubled it to match the Raspberry Pi Model B+'s 512MB, but a redesigned board that reduced the footprint and weight while retaining the larger 40-pin general-purpose input/output (GPIO) header and full-size display and camera (DSI and CSI) headers. After that, though, the Model A+ disappeared. The Pi 2 and Pi 3 launched exclusively in Model B guise, though with the redesigned PCB and larger GPIO header of the original Pi Model B+, and the ultra-low-cost Pi Zero was released to fill the gap previously covered by the now-missing Model A+. The launch of the Pi 3 Model B+, which came with enhanced Wi-Fi and a more powerful processor, highlighted the problem with that approach: There's a massive gap in performance between the 1GHz single-core 32-bit Broadcom BCM2835 on the Pi Zero family and the 1.4GHz quad-core 64-bit Broadcom BCM2837B0 on the Pi 3 range - not to mention the difficulties in using the micro-USB, mini-HDMI, compact CSI connectivity, and completely missing analogue audio and DSI ports on the Zero, compared to the larger boards' full-size hardware. Today's launch of the Raspberry Pi 3 Model A+, then, is designed to finally address the gap - and comes at what co-founder Eben Upton hints may be the end of the 'Classic Raspberry Pi' family and its BCM283x system-on-chip. The new board packs the same BCM2837B0 processor as the full-size Pi 3 Model B+, and benchmark testing shows there's no loss in performance or thermal management from the switch to a smaller circuit board. 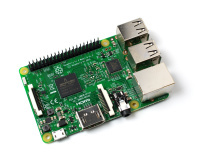 Aside from the lack of USB ports and Ethernet connectivity, though, there's one big difference between the Pi 3 A+ and B+: The memory is once again halved, dropping from the 1GB of the Pi 3 B+ to 512MB. Another loss, though one likely to affect fewer users, is the Power over Ethernet (PoE) header, which wouldn't be much use without an Ethernet port. The drop in specification has led to a drop in price, though: At £23.50 from UK specialist Pimoroni the board is £10.50 cheaper than the Pi 3 B+ (both inc. VAT). It's also less power-hungry, drawing less power at idle and load than the Pi 3 B+ - though considerably more than the original Raspberry Pi Model A+, naturally. More information is available on the official announcement.